Colleen O'Rourke is mostly happy tending bar at the Manningsport, New York, tavern she owns with her twin brother. She holds the dual reputation as the town matchmaker and most eligible bachelorette—until Lucas Campbell, her first love, walks into the bar ten years after he broke her heart. There’s still a powerful attraction between them, but Colleen isn’t having it. Not even after she learns that he’s recently divorced. Not even though his dark, flashing eyes undo her whenever he walks into the room. Waiting On You is the third book in the Blue Heron series and arguably better than its recent predecessor. Then again, Kristan Higgins’s best loved books are reunion stories. The same longing simmers between Colleen and Lucas that Higgins brought to her well-loved Just One of the Guys. The story’s many conflicts are well placed. Though Lucas is the only man who has ever moved her, Colleen is too entrenched in her family issues to tend to her own needs. Her father’s selfishness and her mother’s resulting bitterness consume the family. Lucas is too damaged by his own unhappy past to know how to love anyone. With both parents dead by his teen years, the boy was mistreated by both fate and his overbearing aunt. In fact, Lucas’s history smacks of Harry Potter’s cupboard under the stairs. There’s even a Dudley figure, albeit a more lovable one. But the reader forgives Higgins for tugging familiar heartstrings, because the author’s humor is out in full force. Fans should take care not to read this one in church or anywhere else a gut-busting laugh would be inappropriate. 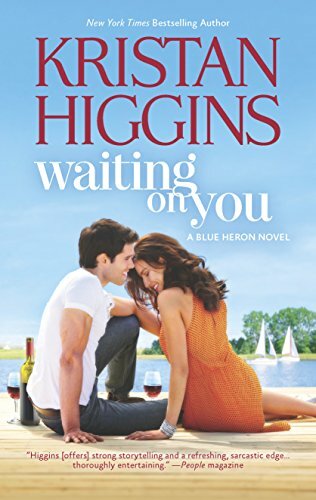 Waiting On You has everything that Higgins’s fans expect: smoldering sexual tension, messy, hilarious family ties, and laugh-out-loud humor.